Marokko er nå i ferd med å få et såkalt "Advanced Status"-samarbeid med EU. Men hittil har ikke EU prøvd å hindre at okkuperte Vest-Sahara dras med i samarbeidet. Dersom de okkuperte områdene innlemmes i EU-partnerskapet, kan det få svært uheldige konsekvenser for saharawiene og Vest-Sahara-saken. Bli med i kampanjen for at okkuperte Vest-Sahara skal holdes utenom samarbeidet mellom Marokko og EU! Er du medlem av en organisasjon som kanskje kan tenke seg å støtte appellen nedenfor? 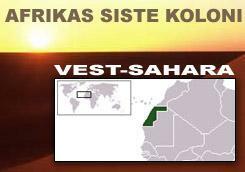 Appellen krever at Vest-Sahara skal holdes utenom Advanced Status-samarbeidet som Marokko er i ferd med å inngå med EU. Appellen ble åpnet 1. november 2008. Bare organisasjoner kan signere. De som har anledning til å slutte seg til, bes melde fra til belgiske Sara Eyckmans på epost advancedstatus@wsrw.org. Skriv eposten på engelsk. 1) navnet på organisasjonen deres (på norsk og engelsk). 3) navn på personen som signerer på vegne av organisasjonen deres. Det er svært nyttig om dere kan få med dere andre norske og europeiske organisasjoner til også å slutte seg til oppropet. Kontakt gjerne Støttekomiteen for Vest-Sahara om dere har spørsmål om kampanjen. Deadline for å signere er 3. desember 2008 kl. 16.00. Appellen vil bli sendt til EU-kommisjonen dagen etter. We, the signatories of this petition, demand that the European Union do not grant a so-called Advanced Status to Morocco, unless the occupied part of Western Sahara is specifically excluded from the agreement. The EU and Morocco are currently in discussion on deepening their ties through this cooperation but, so far, there has been no mentioning in the reports from the EU-Morocco talks as to what is being done to prevent occupied Western Sahara from being included into the cooperation agreement. If the EU would actually grant Advanced Status to occupied Western Sahara, through its negotiations with Morocco as the occupying power, it will give an unfortunate sign of support to the unfounded Moroccan claims over the territory. It could also lead to the EU damaging the UN’s efforts to decolonise the territory. We would like to underline that Morocco continues to be an illegally occupying power in Western Sahara, in violation of over 100 UN Resolutions which call for the Western Sahara’s people’s right to self-determination. A number of Resolutions point to the fact that Western Sahara is an occupied and annexed territory. Furthermore, the International Court of Justice has rejected Morocco's claims over Western Sahara, and the UN considers the Western Sahara case as a decolonisation issue. Under international customary law, the EU and its member states have a duty of non-recognition of the Moroccan annexation of Western Sahara, and to support the decolonisation of the territory. It is also a moral obligation, as long as the Sahrawi people suffer either in exile or under severe human rights violations committed by the Moroccan forces in the occupied territories of Western Sahara. The EU should therefore make sure that Western Sahara is unambiguously excluded from the territorial applicability of the Advanced Status cooperation, without delegating this responsibility to Morocco itself. If the EU was to make such a precision, it would follow for instance the USA, who in their free trade agreement with Morocco have specifically excluded Western Sahara. It would also follow its own example of excluding the Palestinian territories from the EU-Israel Association Agreement. We urge the EU to follow these precedents and support the UN peace process by respecting its duty of non-recognition. We, the signatories of this petition, are in principle not against a strengthened cooperation between the EU and Morocco. However, we demand that the agreement coming out of the Advanced Status talks will clearly specify that its applicability shall not extend further south than to Morocco’s internationally recognised southern border, namely 27°40’N.